Hand-crafting custom guitars and basses since 1988. 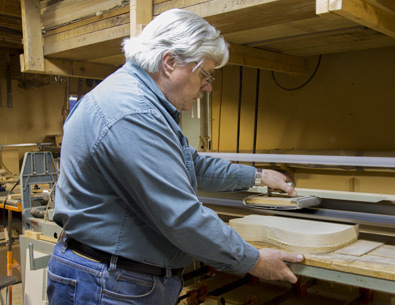 Zane O'Brien, luthier and owner of Legend Guitars has been involved in the woodworking industry since 1970. As a professional musician and master woodworker for many years, Zane knows what it takes to create high quality electric guitars and basses. Legendary guitar players all over the world are looking for that ultimate guitar that appeals to their eye and has the sound and playability they are looking for. "I think I may just have what they are looking for- a Legend." Legend Custom Guitars was established in 1988. At Legend Guitars, we go out of our way to seek out and buy some of the most beautiful and often rare woods found on this earth. Our goal is to create something very special with these exotic woods and to finish the wood in a way that will bring out the very best of these precious species. For this reason, almost every guitar we build is unique and different and we think that you will like that. At Legend Guitars we do not mass produce; rather, we produce to a standard of excellence and consistency that results in only the highest quality instruments being built- we wouldn't have it any other way. Attention to detail is critical when building quality electric guitars and detail is exactly what we focus on with every guitar. We know that musicians who are looking to purchase a quality well made electric guitar, want to feel comfortable that it will be done right and that is exactly what we promise. Many professional musicians who own a Legend Guitar already know this. We do not take short-cuts that could affect quality or skimp on materials; its' just not worth it. Many of our guitar bodies have book-matched tops. Book-matching is a process where by you re-saw (edge to edge through the center) a board and then open up the board (which is now two boards) much like you would open a book to the middle pages. This process results in a mirror image of the wood grain on both sides when the two boards are joined together. After the two pieces are glued together and thickness sanded, we laminate the book-matched top to the body core wood (poplar, mahogany, ash, basswood, etc) in a large press. The body is then thickness sanded to the final thickness. This is how we do many of our exotic guitar tops. 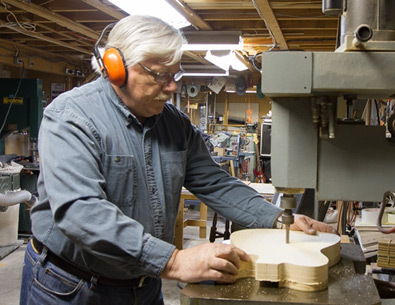 The Legend Guitar Shop is fully equipped with state-of-art woodworking equipment and specialized tooling for building guitar bodies, necks, inlay work and finishing work. But more importantly, it is craftsmanship and dedication to excellence that makes our guitars stand out. We work very closely with every musician who orders a custom guitar, to ensure that they get exactly what they are looking for in a custom instrument. The Legend Guitar Custom Shop is very competitive price-wise in offering well made, high quality guitars and bass for the discriminating buyer. Our guitars are well packed and protected for shipping and are always fully insured. Our guitars are sold either with or without a case and can be shipped either way. Additional information on Legend Guitars can be found in the, "Blue Book of Electric Guitars", current edition.